Palisade gates are the perfect match for palisade fencing. Manufactured from heavy duty steel, our range of palisade pedestrian gates are extremely durable and able to withstand the harshest of physical assaults. Available in heights ranging from 1.8mtrs to 2.4mtrs our Single Leaf Palisade gates are supplied from stock with a standard width of 1.2m wide. Other widths & heights are available but would be made to order. Please call for any further information or for a delivery price on 01204 578012. Single leaf palisade gates are ideally suited for pedestrian access. Standard heights for palisade gates are 1.8mtr, 2.0mtr, 2.1mtr, 2.4mtr and 3.0mtrs. Standard widths for single leaf palisade gates are 1.0mtr, 1.2mtr (stock item), 1.5mtr and 2.0mtr wide. 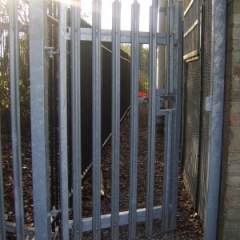 Palisade gates are supplied as standard in hot dip galvanised finish. This finish gives the palisade gates excellent corrosive resistant properties ensuring that our range of palisade gates stand the test of time and are able to withstand the harshest of atmospheric conditions. An additonal powder coated finish is available if required, please contact the store for pricing and availability. The powder coated finish is applied after the hot dip galvanised finish. Powder coated finishes are often chosen by those looking for improved aesthetics and also looking for the palisade gates to match with surrounding corporate colours.